Current Maynard Ferguson and Big Bop Nouveau news and announcements. Kenneth G. Robinson was born on December 26, 1967 and started playing trumpet at the age of 12. Mr. Robinson attended Interlochen Music camp in the summers during high school, where he was a concerto competition winner, and graduated from East Detroit High School in 1986. Mr. Robinson then attended Wayne State University on a full talent scholarship. In the spring of 1991, Mr. Robinson met and studied with his boyhood hero Maurice Andre at the New York Brass Conference. Some of Mr. Robinsons teachers also include Brian Moon, Jim Underwood, Armando Ghitalla, Walter White, Jerome Callet, Gordon Stump, Kevin Good and Bill Lucas. Mr. Robinson has been featured in numerous TV and radio commercials as well as having performed and recorded with the Ann Arbor Symphony, Rochester Symphony, Warren Symphony, Michigan Opera Theatre, Musica Sacra, International Symphony, Moody Blues, Harry Belofonte, Kenny Rogers, Jerry Lewis, Frankie Ruiz, Lalo Rodriguez, Sponge, ICP, Snoop Dog, Josh Bramhall, Spyder Turner, The Temptations, The Ojay's, Reggie Watkins The A - List, and many more. Maynard's lead trumpeter, Patrick Hession [bio], isn't just sitting around during Big Bop Nouveau's December break. He's playing with classic rockers Lynyrd Skynyrd on December 30th in Michigan! Details of the show are here. Former MF trumpeter (and fan favorite) Carl Fischer has just been hired by none other than Billy Joel to perform with him on his upcoming tour. Carl will be playing trumpet and superbone. The MF Tribute Page has had a pretty decent quarter in its partnership with Amazon.com so far. But there are only a few days left in Q4! If you have any Amazon shopping to do, I would ask you (as a favor) to do so from any of the Amazon links on this site or from this link to Amazon.com. s748593: Free shipping on orders of $100 or more. Do you love MF and have some artistic ability? I'm looking for someone to design a few MF wallpapers that will be made available as free downloads from this site. Contact me at matt @ ferguson.net (no spaces) if you're interested. Patrick Edward John Hession was born on April 29, 1968, in Lafayette, Indiana and began playing trumpet at age twelve. Patrick enrolled at Ball State University in 1986, where he studied with trumpeters Paul Everett, Larry McWilliams and Jeff Anderson. In 1991, he won Outstanding Lead Trumpet at the Elmhurst College Jazz Festival with the Ball State University Jazz Ensemble I. Hession joined the Lionel Hampton Big Band as the third trumpeter in 1992, where he apprenticed the lead trumpet book with Tony Barrero. Hession then played lead and solo trumpet for Lionel Hampton on various tours over the next four years. In 1992, Hession accepted a full music scholarship to the University of Nevada, Las Vegas, where he studied with trumpeters Michael "Rocky" Winslow, Tom Porrello, Bobby Shew, Stan Mark, Walt Blanton and William C. "Billy" Hodges. Patrick also studied with Keith Whitford, Bob Schlatter and Martha Ream. In 1996, Hession joined The World Famous Glenn Miller Orchestra, where he was the lead and feature trumpeter for almost three years. Hession then realized his dream in 2000, when he joined Maynard Ferguson's Big Bop Nouveau Band, where he has been the lead trumpeter for over the past five years. As well as being an active sideman, Hession has played with Marty Allen & Steve Rossi, Paul Anka, Little Anthony & The Imperials, Susan Anton, The Association, Randy Brecker, Ray Brown, Conte Candoli, Charo, Pete Christlieb, Denis DiBlasio, Vince DiMartino, The Temptations Review Featuring Dennis Edwards, Michael Feinstein, Carl Fontana, The Four Freshmen, The Four Tops, Heart, Steve Houghton, Jerry Lewis, Frank Mantooth, Rich Matteson, Rob McConnell, Don Menza & The Don Menza Big Band, The Mills Brothers, Bob Mintzer, The OJ's, Diane Reeves, Martha Reeves & The Vandellas, Rufus Reid, Mavis Rivers, Lalo Rodrigues, Ed Shaughnessy, Diane Schuur, Bobby Shew, Marvin Stamm, Dave Steinmeyer, Spyder Turner, Frankie Valli & The Four Seasons, Ben Vereen, Joe Williams, Phil Woods Quintet, Snooky Young, the International Symphony Orchestra, recorded with Diane Schuur & Maynard Ferguson, "Swingin' for Schuur", 2001, Reggie Watkins, "A-List", 2004 and Kenneth Robinson's debut classical CD,"Festive Masterpieces for Trumpet and Organ", where Patrick played 2nd piccolo trumpet in A and 4th, 5th and 6th trumpet in G. He has authored a book in 2003, "For the sake of lead trumpet playing - HESSIONS SESSIONS Guide to consistent, reliable and sometimes, Invincible Chops!" Also in 2003, Patrick subbed on 3rd trumpet for "The Producers". In 2005, Patrick played lead trumpet for "The Rat Pack Returns in The Tribute to Frank, Joey & Dean". Hession plays Monette Trumpets and Mouthpieces exclusively and is a clinician for the David G. Monette Corporation. Peter Ferguson grew up in upstate New York performing with many different groups including Ringling Bros. and Barnum and Bailey Circus. Peter was also the musical director for the Great Escape Amusement Park Circus in Lake George, NY. Peter then went on to study with Lou Soloff at the State University of New York at Purchase. After college, Peter joined Carnival Cruise Lines, performing and conducting in their show bands onboard over ten different Carnival vessels. Peter went on to become a Musical Supervisor and band leader for Carnival Cruise Lines, and worked with them for eight years. Peter moved to Las Vegas in 1996 where he has performed in all the major venues, and with many headliners as well as local acts. In 1999, Peter joined Maynard Ferguson and Big Bop Nouveau, touring and recording for three years before returning to Las Vegas. Peter can be heard on the Concord release "Swingin For Schuur", featuring Diane Schurr, Maynard Ferguson, and Big Bop Nouveau. In 2005, Peter returned to Maynard Ferguson and Big Bop Nouveau, with which he is currently touring. Jamie completed his Masters in Jazz Studies this spring from the University of North Texas, and was lead trumpet in the One O'Clock Lab Band from 2004-2005. Jamie has traveled the world with various jazz, classical, Latin, pop, and blues ensembles. Being from Vancouver, Canada, Jamie has been enjoying learning to say "huh" instead of "eh"! Reggie Watkins was born and raised in West Virginia and has played trombone for eighteen years. After attending West Virginia University for Music Performance he moved to Pittsburgh, Pennsylvania to become a staple on the music scene. There he began playing and recording with various groups such as The Roger Humphries Big Band, The Kevin Frieson Ensemble, Dr. Zoot, and many others. In 1999 Reggie joined Maynard Ferguson and is currently Trombonist, Musical Director, and Arranger for the legendary jazz musician. In 2003 Reggie was selected as one of only eleven semi-finalists chosen to perform at the prestigious 2003 Thelonious Monk Institute International Jazz Competition in Washington D.C. There he performed with an all-star jazz group consisting of pianist Eric Reed, bassist Bob Hurst, and drummer Carl Allen. In 2004 Watkins released his first solo CD as Band Leader, Trombonist, Composer, Arranger, and Producer entitled A-LIST. The album features sixteen musicians, all original compositions and arrangements, and is part of The Maynard Ferguson Presents series. Reggie is also featured as Trombonist and Arranger on the 2001 Maynard Ferguson/Dianne Schuur release 'Swingin For Schuur'. Reggie can be heard performing most often with Big Bop Nouveau and his own group The A-List Octet. Julio Monterrey was born in Managua, Nicaragua but left at a young age with his parents to Miami, Fl in search of political asylum and the American Dream. At the age of 15 he was introduced to the magic of song. Something drew Julio to the saxophone which has become the fountain of his inspiration. Jazz came soon after where he immersed himself in the classic recordings of Charley Parker, John Coltrane, Louie Armstrong and many others. While attending Florida International University, Gary Campbell and Mike Ortta were great influences in his musical beginnings. At this time Julio was also experimenting with his own acid jazz group, winning several local polls. In 1999 Julio was admired by the New School. A year later he found himself drawn back to his boyhood home of Miami where he has written and sold many highly acclaimed original compositions to a local record label. Julius is a lover of many styles of music and is always in search of fresh ideas. Matt was born and raised in Fort Lauderdale, FL, where he picked up his first saxophone at the youthful age of 14. After graduating high school, Matt found himself in New York City - that sleepless American metropolis, wherein he could finally devote his practice to a unique collection of resources, energy, and culture. In this fertile yet chaotic arena, he acquired a degree in jazz performance from the New School. Matt has since played with artists such as David O Rourke, Junior Mance, Phil Woods, and Reggie Workman to name a few. He carries a sundry pallet of both bold and delicate tones, which compliment a powerful yet warm presence on the stage. Matt is currently composing and recording original music for a variety of artistic venues, ranging from film to dance. Jeff Lashway, originally from Pittsburgh, PA. has performed all over the U.S, Canada, and Europe. Formal training consisted of 11 years of private, classical piano before branching out into jazz and pop music on his own. Having lived also in Indianapolis and New Orleans, Jeff has incorporated many styles of playing into his own unique style. In addition to Maynard, Jeff has played with Slide Hampton, guitarist Joe Negri, and legendary New Orleans cornetist Connie Jones. Hailing from Anderson, SC, Brian Mulholland is the bassist for Maynard Ferguson. Despite starting on piano at age 3, he switched to the bass in fifth grade. After only three months, he substituted for the high school jazz band bassist. Befriending Victor Wooten at age 12, Brian performed with Grammy® winner Béla Fleck after learning his repertoire. Brian has gone on to share the stage with Darol Anger, Chris Potter, Terri Lyne Carrington, and David Haynes, to name a few. He has performed at International Association of Jazz Educators and International Society of Bassists conferences, toured Europe with the USC Left Bank Big Band, and transcribed Bass Day 98: Victor Wooten for Hudson Music. Brian holds degrees from the University of South Carolina (B.M.) and the University of North Texas (M.M.). Since the fall of 2003, Stockton Helbing has been the drummer for Maynard Ferguson. While working with Maynard, Stockton has toured and performed throughout the United States and in Germany, Thailand, Sweden, England, Switzerland, the Czech Republic, Luxembourg, and St. Lucia. Stockton recently released Lodestar, his debut album as a bandleader. Lodestar, a NohJoh Music release, is an all original music project that also features Stockton's contemporaries Ken Edwards, Tom Luer, Noel Johnston, and Brian Mulholland. Lodestar was selected by Maynard Ferguson to be the newest album in his MF Presents series. Stockton graduated from the University of North Texas with a bachelor's in Music in May 2003. He attended the highly esteemed jazz school from the fall of 1998 until the spring of 2003. During those years Stockton studied with world renowned drum set teacher Ed Soph. Stockton was also a member of the Grammy award winning One O'clock Lab Band, under the direction of Neil Slater. Stockton appears on two of the One O'clock Band's albums, LAB 2002 and Lab 2003. After training his musical ear by working as a full time professional guitarist for over 25 years, MIKE FREELAND, has been mixing Front of House or Monitors for a wide variety of artists including The Lettermen, Diane Schuur, the Count Bassie Orchestra, the Tubes, Loretta Lynn, Little Richard, Sha Na Na Na, the 2005 Vocal Group Hall of Fame Inductions, which included The OJays, The Jordaneires, Martha Reeves and the Vandellas, to name just a few. Mike has over 600 shows under his belt mixing MAYNARD FERGUSON. Immediately following 5 years as a percussion / business major at the University of Tennessee; Ed Sargent began working with Maynard Ferguson in the spring of 1982. Ed began his tenure first as the valet, working directly as a personal assistant to Mr. Ferguson while shortly afterwards, Ed assumed the task of Stage Manager / Lighting Director and the Fall of 1984 the Tour Manager job came be. Ed actively produces around 200 live shows a year with the great Maynard Ferguson. Over the years Ed has had the opportunity to produce / Tour Manage acts like, Art Blakey, Diane Schuur, Heart, Dizzy Gillespie, Marlena Shaw, Billy Eckstein, Dr. Lonnie Liston Smith, Al Hirt, Billy Cobham and more. Ed has also been actively involved as the Executive Producer of many of Maynard Ferguson projects over the years namely. Foot Path Café, Live From London, These Cats Can Swing, One More Trip To Birdland, Brass Attitude with DVD projects including At The Top and also Directing and Executive Producing on Live at the King Cat Theatre in Seattle, Washington with Diane Schuur. Ed has also been actively involved in the Maynard Ferguson Presents Series as Executive Producer for the projects with Tom Garling, Christian Jacob, Carl Fisher and Maynards current Musical Director, Reggie Watkins. Patrick Edward John Hession was born on April 29, 1968, in Lafayette, Indiana and began playing trumpet at age twelve. Patrick enrolled at Ball State University in 1986, where he studied with trumpeters Paul Everett, Larry McWilliams and Jeff Anderson. In 1991, he won Outstanding Lead Trumpet at the Elmhurst College Jazz Festival with the Ball State University Jazz Ensemble I. Hession joined the Lionel Hampton Big Band as the third trumpeter in 1992, where he apprenticed the lead trumpet book with Tony Barrero. Hession then played lead and solo trumpet for Lionel Hampton on various tours over the next four years. In 1992, Hession accepted a full music scholarship to the University of Nevada, Las Vegas, where he studied with trumpeters Michael "Rocky" Winslow, Walt Blanton, William C. "Billy" Hodges, Bobby Shew and Tom Porrello. Patrick also studied with Keith Whitford, Bob Schlatter and Martha Ream. In 1996, Hession joined The World Famous Glenn Miller Orchestra, where he was the lead and feature trumpeter for almost three years. Hession then realized his dream in 2000, when he joined Maynard Ferguson's Big Bop Nouveau Band, where he has been the lead trumpeter for over the past five years. As well as being an active sideman, Hession has played with the International Symphony Orchestra, recorded with Diane Schuur & Maynard Ferguson, "Swingin' for Schuur", 2001, Reggie Watkins, "A-List", 2004 and Kenneth Robinson's debut classical CD,"Festive Masterpieces for Trumpet and Organ", where Patrick played 2nd piccolo trumpet in A and 4th, 5th and 6th trumpet in G. He has authored a book in 2003, "For the sake of lead trumpet playing - HESSIONS SESSIONS Guide to consistent, reliable and sometimes, Invincible Chops!" Also in 2003, Patrick subbed on 3rd trumpet for "The Producers". In 2005, Patrick played lead trumpet for "The Rat Pack Returns in The Tribute to Frank, Joey & Dean". Hession plays Monette Trumpets and Mouthpieces exclusively and is a clinician for the David G. Monette Corporation. Matt was born and raised in Fort Lauderdale, FL, where he picked up his first saxophone at the youthful age of 14. After graduating high school, Matt found himself in New York City - that sleepless American metropolis, wherein he could finally devote his practice to a unique collection of resources, energy, and culture. In this fertile yet chaotic arena, he acquired a degree in jazz performance from the New School. Matt has since played with artists such as David O' Rourke, Junior Mance, Phil Woods, and Reggie Workman to name a few. He carries a sundry pallet of both bold and delicate tones, which compliment a powerful yet warm presence on the stage. Matt is currently composing and recording original music for a variety of artistic venues, ranging from film to dance. Hailing from Anderson, SC, Brian Mulholland is the bassist for Maynard Ferguson. Despite starting on piano at age 3, he switched to the bass in fifth grade. After only three months, he substituted for the high school jazz band bassist. Befriending Victor Wooten at age 12, Brian performed with Grammy® winner Béla Fleck after learning his repertoire. Brian has gone on to share the stage with Darol Anger, Chris Potter, Terri Lyne Carrington, and David Haynes, to name a few. He has performed at International Association of Jazz Educators and International Society of Bassists conferences, toured Europe with the USC Left Bank Big Band, and transcribed Bass Day '98: Victor Wooten for Hudson Music. Brian holds degrees from the University of South Carolina (B.M.) and the University of North Texas (M.M.). After training his musical ear by working as a full time professional guitarist for over 25 years, MIKE FREELAND, has been mixing Front of House or Monitors for a wide variety of artists including The Lettermen, Diane Schuur, the Count Bassie Orchestra, the Tubes, Loretta Lynn, Little Richard, Sha Na Na Na, the 2005 Vocal Group Hall of Fame Inductions, which included The O'Jays, The Jordaneires, Martha Reeves and the Vandellas, to name just a few. Mike has over 600 shows under his belt mixing MAYNARD FERGUSON. Immediately following 5 years as a percussion / business major at the Univeristy Of Tennessee; Ed Sargent began working with Maynard Ferguson in the spring of 1982. Ed began his tenure first as the valet, working directly as a personal assistant to Mr. Ferguson while shortly afterwards, Ed assumed the task of Stage Manager / Lighting Director and the Fall of 1984 the Tour Manager job came be. Ed has also been actively involved as the Executive Producer of many of Maynard Ferguson projects over the years namely. "Foot Path Café", "Live From London", These Cats Can Swing", "One More Trip To Birdland", "Brass Attitude" with DVD projects including "At The Top" and also Directing and Executive Producing on "Live at the King Cat Theatre in Seattle, Washington with Diane Schuur". Ed has also been actively involved in the Maynard Ferguson Presents Series as Executive Producer for the projects with Tom Garling, Christian Jacob, Carl Fisher and Maynard's current Musical Director, Reggie Watkins. Maynard Ferguson Orchestra & Octet. Merchandise news: 2 Maynard albums have just been re-issued. MF Horn 1 and Maynard Ferguson (also known as Alive and Well in London) are now available on CD! They can be ordered from Amazon or from Wounded Bird Records. Note: Ordering from Amazon benefits this site directly. MF's first DVD, Live At The Top, is now available at Amazon for only $9.99! A new DVD featuring MF and Big Bop Nouveau is now available at MF concerts. It will be available on this web site in the next month or so. Thank you for your thoughts for Maynard and our family. Our mother's passing, while a sad occassion, was painless and we are thankful that Maynard was home to be with her to the end. Maynard and Flo had a wonderful marriage together for five decades. They were an inspiration to us all in their devotion and love for each other. Flo was a fiery spirit who kept Maynard entertained and happy. Many of their adventures together took them to exotic places. They fell in love with India - its music, colors, smells, and spirituality. It influenced his music and their lives. As per Flo's wishes, there will not be any services beyond immediate family. For those of you asking what you might be able to do or send after the loss of Flo, the family is requesting dontations be sent to the Seva Foundation - www.seva.org. Seva is active in India as well as many other countries around the globe doing much for very little. "Seva is a donor-supported non-profit foundation building partnerships to respond to locally defined problems with culturally sustainable solutions throughout the world." Thank you again for your thoughts during this time. An official condolences thread can be found on the MF Forum. MF's first DVD, Maynard Ferguson Live At The Top, shipped on February 15th and we've sold over 1000 through this site! Finally, the fans have some MF video! If you haven't ordered it yet, order it now! Next week, the MF Tribute Page turns 9 years old! MF's first DVD is now available for order! The biggest MF news since Stratospheric. MF's first DVD will be available on this website and on tour in January! If you haven't heard already (it was revealed at Stratospheric), Maynard is no longer playing exclusively on a Holton. Beginning last month, he added a Monette Prana to the lineup. Here's a feature about Maynard's new horn, including a video clip of MF trying it out. Wounded Bird Records has done it again. Another Maynard Ferguson CD re-issue. This time it's Ridin' High . "Link Pavey of WMKV radio 89.3 FM (Cincinnati, Ohio) did an interview with Mr. Ferguson one week ago. The interview will be a special one hour radio event including some Maynard recordings. The special will air on Monday October 11 & 18 @ 7pm and Saturday October 16 & 23 @ 5pm. If you could let the Cincinnati fans know, that would be great!" I did some checking, and you can listen to WMKV live at this website. We should try to tune in! The folks at Wounded Bird Records have once again come through with a Maynard Ferguson CD re-issue. In November, the album "Ridin' High" will be available on CD. Just another reminder that the Maynard Ferguson Institute of Jazz Studies is running out of funding and could use the help of Maynard and jazz education fans everywhere! To donate, make a contribution to Rowan University, but (important) you MUST specificy that the funds are for the MF Institute of Jazz Studies in the memo of the check. These contributions are tax deductible. Maynard Ferguson lead trumpeter Patrick Hession has just revamped his web site. You'll find a cleaner look and more information, including a place to order his book from! Now I would like to ask you to dig into your wallets and pocketbooks and donate to 2 Maynard-related causes. The Maynard Ferguson Tribute Page Forum is once again up for renewal. Last year, forum members contributed generously and covered the cost of an entire year of Gold service (no pop-ups). This year, the price is significantly higher, because the price is based on usage. Current renewal prices are: $71 for 3 months, $119 for 6 months, and $214 for a year. If you think you can contribute, please click the banner below. The Maynard Ferguson Institute of Jazz Studies at Rowan University is running out of funding and could really use our help! To donate, make a contribution to Rowan University, but (important) you MUST specificy that the funds are for the MF Institute of Jazz Studies in the memo of the check. These contributions are tax deductible. I sincerely thank you for any contribution you could make to either cause. I have all of the details around the Maynard Ferguson tribute, "Stratospheric". I will be attending! If you can make it, make sure to say hello! Read all about it. JazzPlayerRadio, the Maynard-inspired internet radio station has just become new and improved! Details here. Maynard fans were give quite a treat this month, with FIVE re-issues! Hot, Hollywood, It's My Time, New Vintage, and Primal Scream have all hit CD for the first time! Read about it here. Ken Poston is hosting an all-star tribute to Maynard from Sep 30 - Oct 3rd in Los Angeles. At first, the line-up was so outstanding that I took it to be a hoax. But it REALLY IS HAPPENING. This is a once in a lifetime opportunity for fans. I don't want to post too many details here, because as I understand it, the line-up is not finalized yet. But you can see what's been discussed so far on this thread from the MF forum. Wounded Bird Records, the company that brought us "Carnival" on CD for the first time, is planning to release five of Maynard's Columbia albums on CD for the first time this month. No, they aren't the MF Horn Series (Sony seems to want to release those on their own), but they are rumored to be five of MF's most popular Columbia albums: Hot, New Vintage, It's My Time, Primal Scream, and Hollywood. I'll post another news item when these are ready for order. Jake Sommers' MF-themed Internet radio station, called Jazz Player Radio, is officially up and running! This thing is a blast and is really taking off. Jake has already had over 1600 listeners, and he's provided some amazing content so far, including exclusive interviews with Maynard himself and former MF lead player (and current Harry Connick, Jr. lead player) Roger Ingram. If you haven't heard it yet, you are missing out. Visit Jazz Player Radio's official website for more details or to listen to the station. While not technically Maynard news, trumpet player Jim Manley has a new CD out entitled "Alter Ego". I've been a Jim Manley fan since I was first introduced to his music about 8 years ago, and this new CD is my favorite Jim Manley CD yet. It's a throwback to a more groove-oriented period of jazz, and it's just great. It has a nice balance between screaming trumpet and straight-ahead jazz solos. I'd highly recommend heading over to Jim's site, listening to the sound clips, and ordering a copy. Super MF fan and radio man Jake Sommers has started an MF internet radio station! Read all about it here! Last month I mentioned that Big Bop Nouveau lead player Patrick Hession's new trumpet book would be ready for sale soon. Well, now is soon! You can purchase his new book from his website. I will post more details about the book after I've had time to look through it more closely, but at a glance it appears to consist primarily of exercises designed to improve range to increase the reliability of your chops. The book also pays props to the Boss in a section about the importance of breathing. Patrick refers to MF as "breathing perfection". You can purchase the book here. MF and Big Bop Nouveau just kicked off their first tour of 2004 in Seattle. A fan has posted a review and some pictures already in the MF Forum. 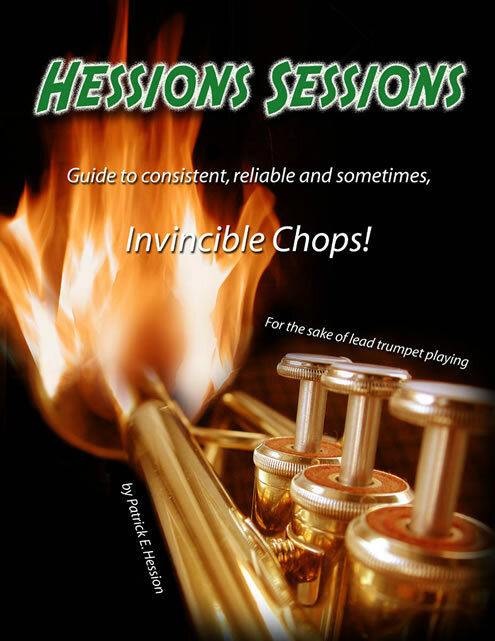 Super accurate MF lead player Patrick Hession will soon be releasing a book. Here is a sneak of the cover (click on the image to see the full size version). Patrick's website will soon be ready to accept orders for the book. I will make sure to mention it again when it's ready for purchase. Some of you may have seen this already, but here's a review of an MF show online. Alan Baylock is a trumpet player from North Texas and a great jazz writer. He wrote "Blues From Around Here" that you all know from the "One More Trip to Birdland" album. Alan Baylock has just released his first solo CD. It's called "Two Seconds To Midnight" with the Alan Baylock Jazz Orchestra. I haven't received my copy yet, but the sound clips on his web site are very impressive. The album also features MF alumnus Brian MacDonald (trumpet). Recently announced: On Friday, October 3rd, The Touhill Performing Arts Center on the campus of the University of Missouri (in St. Louis) will host a Tribute to Maynard Ferguson. The concert will open with a Maynard Ferguson Tribute Band with alumni including Stan Mark, Denis DiBlasio, Chip McNeil, Tom Garling, Carl Fischer and others. Arturo Sandoval and his band will follow the Tribute Band. The second part of the show will feature the Boss with The Big Bop Noveau Band. I am sure there will be a few other guests at the end of the show on stage. Tickets for the concert are $35 $25 $15 plus $1 service charge and are available by visiting the ticket office at 8001 Natural Bridge in St. Louis or by phone at 866-516-4949 or 314-516-4949. There are also a limited number of VIP tickets in the first 2 rows at $100 and include the post show reception with the musicians and including an open bar. Also rumored will be the announcement of a new Maynard Ferguson Music Scholarship. For more info go to www.touhill.org. MF alumni Carl Fischer (trumpet) made an appearance on the USA Network on August 25 as part of the US Tennis Open's opening ceremonies in Flushing, NY. This was brought up as part of a thread on the Maynard Ferguson Tribute Page Forum. Soon Carl himself posted and announced that he will be joining Big Bop Nouveau as part of their tour starting on September 10th. He has also just finished his record and his book, as well as a web site at www.fischmusic.com. I'd say he's been busy! I wanted to see how much power the MF fan base you serve actually has. I recently got in contact with WXXI in Rochester NY. They are the Rochester public tv and radio stations. They produced a marvelous series of jazz concert performances in the 1970s called 'At the Top'. One featured MF in top form from 1975. Currently WXXI has not seriously tried to get the updated rights to sell this series of tv shows. I'm hoping the MF fan base can make them change their mind. If everyone would send an email/fax or snail mail to WXXI, it might be enough to convince them to update the rights and sell some of these shows on DVD. I will be at the concert at Simpson College in Indianola, Iowa on September 22. If you are going to be there, say hello! Sony Records has remastered Conquistador and Chameleon for a July 1st release date! Many fans have complained that the CDs for these albums sounded flat compared to the LP...hopefully a remaster will produce the CDs the way they were meant to be heard. After 25 years, Carnival has been reissued and is now available from Amazon! Also newly available on Amazon, Arturo Sandoval's new CD "Trumpet Evolution," in which he pays tribute to his favorite trumpet players, including the "Mayn Man". To honor Maynard, he performs the song Maynard Ferguson. I also recently picked up Paul Cacia's "The Symphony Album," which has some really phenomal trumpet playing on it. Some of the songs are a bit dates, but the arrangements are still fresh and the notes are very, very high. Maynard fans will love it. We are getting really close to MF's birthday bash! Confirmed alumni performing on May 3rd include Stan Mark, Lin Biviano, Ernie Garside, Mark Colby, Chip McNeil, Dave Mancini, Alan Wise, Tom Garling, and Slide Hampton! There will also be appearances by Jon Faddis and Mark VanCleave. I recently received an email from John Seery, a Professor and Chair of the Department of Politics at Pomona College in Claremont, California. He has recently published a book titled America Goes to College: Political Theory for the Liberal Arts. Why would this be of interest to Maynard fans? Mr. Seery confessed to me that he has been a lifelong Maynard fan, and managed to include a vivid description of a Maynard Ferguson concert in this book (he tipped me off that fans can check pages 79-80). Thanks for spreading the MF gospel, John Seery! February's rumor that Carnival would be reissued on CD is true! The CD is available now via a small label called Wounded Bird Records. It will be available in major outlets in late April. When it becomes available on Amazon, I will post the link. The first set of Maynard's Blue Note show on Thursday, February 27th is going to be webcast live! I believe the show they will webcast starts at 8:00 Eastern time, or 7:00 here in Iowa. That's 5:00 PM on the west coast. Details here. Larry Foyen, trumpeter is back on the band! Mike Jarosz has left the band. Someone has posted a rumor in the MF forum that the Carnival album will be on CD in April. I have never heard this info, and can't verify it's validity. If I get confirmation, I will post more info. Obviously, this would be great news to MF fans, and I'm sure we would all buy a copy! The latest Big Bop Nouveau lineup includes new MF second trumpet Mike Jarosz. Mike has a great website that has, among other things, some interesting sound clips.